Verrucae are benign epithelial proliferations, characteristically 1–20 mm in diameter, caused by human papilloma virus (HPV) infection occurring on the skin and mucosa (Photomed Laser Surg 33(6):338-42, 2015; Lasers Med Sci 29(3):1111-6, 2014). Prevalence of verrucae is 5–20% in children and young adults with peak incidence reported during teenage years (Lasers Med Sci 29(3):1111-6, 2014; J Am Acad Dermatol 22(4):547-66, 1990; J Korean Med Sci 24(5):889-93, 2009). Patients often express significant displeasure with quality of life due to this cosmetic insecurity, as well as functional problems and physical discomfort when they occur on palms of hands and soles of feet. Traditional therapeutic options for warts, such as topical salicyclic acid, topical imiquimod, bleomycin injections, cryotherapy, surgical excision, and electrocautery, have proven somewhat effective but often lead to high recurrence rates or scarring (Photomed Laser Surg 33(6):338-42, 2015). Laser therapy offers an alternative solution by employing selective tissue destruction with minimal risks. 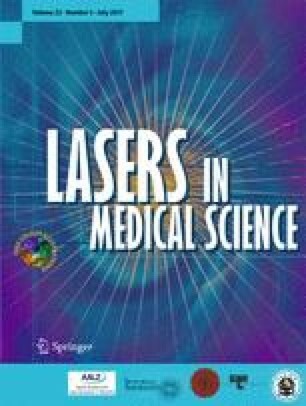 We performed a broad literature search in PubMed to obtain all available published articles that studied the treatment of verrucae on the skin with 1064-nm neodymium-doped yttrium aluminum garnet laser. This laser is specifically suited for verruca treatment due to its deeply penetrating 1064-nm wavelength and relatively low risk of pigmentation changes in dark skin types (Photomed Laser Surg 33(6):338-42, 2015). Laser therapy is effective in the treatment of verrucae and has enabled clinicians to provide direct, targeted treatment of warts. Vincent M. Hsu had full access to all of the data in the study and takes responsibility for the integrity of the data and the accuracy of the data analysis. Study concept and Design: Hsu, Aldahan, Tsatalis, Perper, and Nouri. Acquisition, analysis and interpretation of data: Hsu, Aldahan, Tsatalis, Perper and Nouri. Drafting of the manuscript: Hsu, Aldahan, Tsatalis, Perper, and Nouri. Critical revision of the manuscript for important intellectual content: Hsu, Aldahan, Tsatalis, Perper, and Nouri. Statistical analysis: N/A. Funding sources: N/A. Administrative, technical or material support: Hsu, Aldahan, Tsatalis, Perper, and Nouri. Study supervision: Nouri.